The Game Of Life: Cosmic Jeopardy? Last night, while searching for a drawing reference, I revisited some of my former selves via the thoughts, sketches and the flotsam and jetsam of memory in the small journals I’ve kept for years. This is rather like re-reading a favorite book and finding new insights between the lines. By default, time is a great teacher because in the periods that elapse between readings, our minds have a chance to integrate what we’ve experienced since our first reading into our subsequent ones. This idea also extends to my art. It’s why I think that a work of art is always a work in progress; it sits waiting patiently for you or someone else to impart new insights upon each viewing thereby enriching the presence of that artwork and lending a depth to its purpose that the artist may not have originally understood. All of this musing leads me to offer you one of these little philosophic tidbits that I found in a journal entry of 24 February 1999. 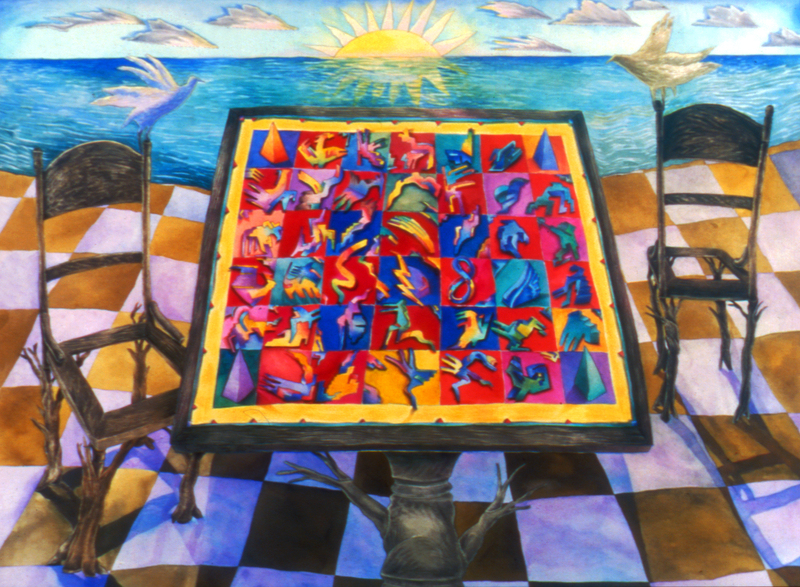 Though it was a stand-alone observation at the time, I now realize that it was the perfect accompaniment for the 1986 watercolor drawing shown above: The Game Of Creation.